great gift..my grandson rides it wide open!!! quick shipping and a great product!!!! This is definitely a great buy! My kids love it so much! We've had it for one year now and it still going perfectly. This Kart is awesome!! We opened the box, my husband pulled it out, easy to assemble, and my son loves it so much! Great birthday present. I must say I am very happy that I bought this for my son. I got this for 2016 Christmas and it still running strong. My son is 10 and fits him perfect. HE loves it, it was a big hit! Awesome Karts! I bought this as a total surprise for my 8 and 10 year old sons and when it got here, they love it and so do all of their friends. I would recommend this item. I received my GK-M05 kart about three month ago and have no regrets..
Works Great! Definitely two thumbs up from me. 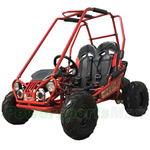 This is a nice go kart for a younger rider, it is really small. The only problem I had with this is that mine did not come with assembly instructions. I was able to figure it out, the assembly is not that hard. It runs great so far. This was a Christmas gift for our kids and boy did it go over great, they love it! Our oldest son is 6 and fits perfectly behind the wheel. Our youngest is 2 and has no trouble riding with his brother. We called before we made our purchase to ask a few questions and the staff was very helpful. We are very happy with our purchase and the service we received from PowersportsMax.com.